Day ride, long tour, ride into town, child transporter, weekly shop, trip to the tip, or moving domestic paraphernalia, the Morpheus, true to its name, changes form to suit its function! Hey there, everyone. It’s Justin from Clever Cycles. Today we’re going to take a look at one of the most fun tandem bikes I’ve ever ridden, the Circe Morpheus. The Circe Morpheus has a unique feature that makes it more than just a tandem bicycle. It can convert from a semi recumbent bike to a cargo bike. More on that later. In tandem mode, the stoker, that’s the person who isn’t steering, is out in front in a recumbent position. This allows for great open views for both the captain and the stoker. No one’s stuck looking at the back of someone’s head all day, and this configuration makes it really easy to talk to each other. The seat and cranks can be adjusted for both children and adults, and there’s a freewheel mechanism between the front and rear riders so the riders can pedal at different speeds and the front rider can even take a break from pedaling. That’s great for when you’re riding with kids or other riders that aren’t as strong, making it a great bike for families or an adaptive bike for people with special needs. 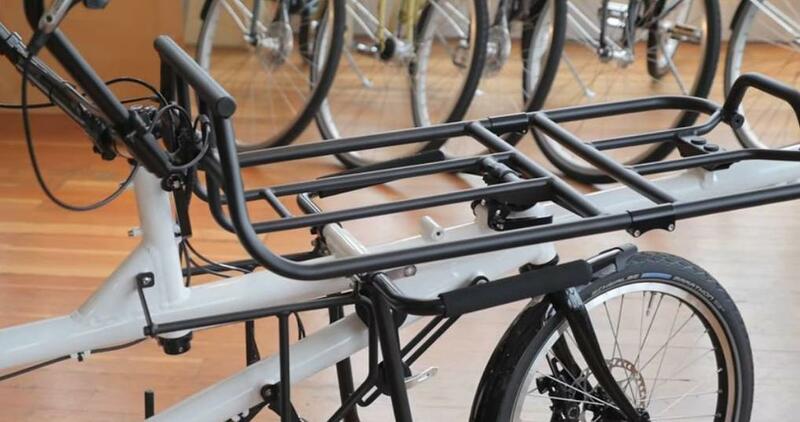 This bike can be outfitted with both front and rear racks so you can use it for commuting, carrying groceries or even touring. But wait, there’s more! Not only can you use the Circe Morpheus as a tandem, it can also be converted into a flatbed cycle truck. The front seat gets replaced with a metal flat bed where you can tie down cargo to pedal it around town. If you’re looking for one of the most versatile tandem and cargo bikes and you want the great views from the semi recumbent seating configuration, check out the Circe Morpheus. Come by the shop today for a test ride, and thanks for watching.